Other than its dimensions, 2015 Topps Mini Chrome Football doesn't stray much from its regular-sized counterpart. 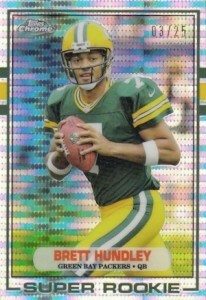 And regular Chrome is largely a spinoff of the flagship set with the addition of Chrome stock. It's a hobby rabbit hole, for certain. 2015 Topps Mini Chrome Football hobby boxes deliver one autograph, a rookie card in every pack and lots of inserts and Refractors. The base set has 200 cards. Half are veterans, half are rookies. While that's straightforward, there is the usual assortment of parallels. Basic Refractors are 1:8 hobby packs. Other Refractor colors include Sepia (1:12), Pulsar (1:24), Green (1:72), Blue (1:144), Purple (1:288), STS Camo, BCA Pink (#/25), Black (#/15), Gold (#/10), Red (#/5), and Superfractor (1/1). Randomly inserted hot boxes have a Diamond Refractor in every pack. Each base card also has four different one-of-one Printing Plates. Select cards also have short print variation versions with different photos. 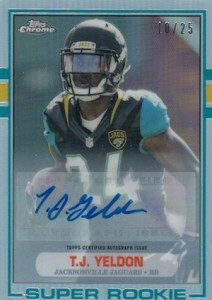 Like basic Chrome, the Rookie Autographs are going to be the driving force of the product for many collectors. All Rookie Autographs have a total of nine different Refractor parallels that are serial numbered to varying amounts. The variations return with signed versions that are both serial numbered and done on Refractor stock. 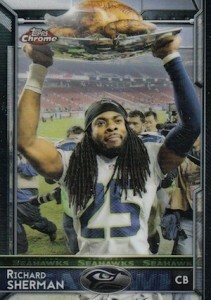 2015 Topps Mini Chrome Football has several basic inserts that take a page from regular Chrome. Super Bowl 50 Die-Cut (1:24) features only players who have won the NFL's biggest prize over the last five decades. These have Refractor (#/50), Pulsar (#/25) and Superfractor (1/1) parallels. 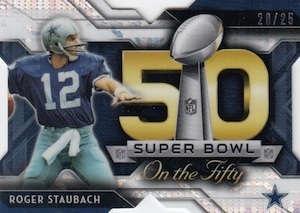 Topps 60th Anniversary (1:12) is sort of like the Archives line in that it draws from the company's past designs to create new cards. Besides a few different Refractors, select cards also have autographed versions that are numbered and done as Refractors. A couple of other inserts also draw from the design vault. 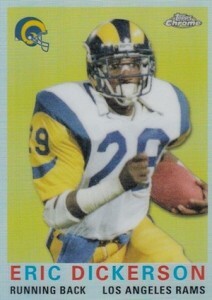 1989 Topps Football (1:6) uses the Super Rookie approach. 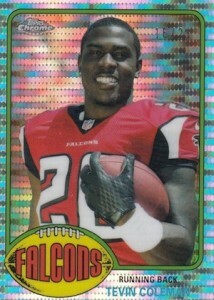 1976 Topps Football (1:24) delves even further into the past for more cards with 2015 rookies. Both of these have numbered parallels. Some players also have signed versions as well. 200 cards. 1 rookie card per pack. Shop for base sets on eBay. I like these cards, but the autographs I’ve gotten so far are not on card autos. They’ve all been stickers. James � The product sell sheet indicated rookie autographs would be on-card but that clearly changed. I feel this is an outstanding product for the value and is honestly the way that regular Chrome should have been executed. The serial numbered autos and refractors are lower numbered than Reg Chrome as well. The only reason I couldnt rate this product 5 stars is due to the sticker autos. In a recent case break, my yield was as follows. 8 total pulsar refractors serial /25 Including Tom Brady, Cam newton, Sean Mannion, Big Ben etc. Several other low numbered Pink Refractors, The Hot Box with 24 Diamond Refractors. Green Refractors fall about 1 every other box, Blue fell 2 in the case and Purple fell 1 per case. Falling 1 per box were pulsars & CAMO Refractors. For you graders out there, there weren’t many imperfections noted. Only some mild alignment issues on some of the pulsars.